Hardneck varieties, Allium sativum var. ophioscorodon, has a stiff central stem surrounded by a single ring of cloves. Cloves are large and easy to peel. Softneck varieties, Allium sativum var. sativum, has a soft central stem (can be braided) surrounded by layers of cloves (usually the outer cloves are larger the inside cloves are smaller). Stores well. I plant both the hardneck and the softneck varieties. ♦ Separate the bulb into cloves, keeping the papery husk on the cloves. ♦ Plant cloves, pointy end up, 3 inches deep and 6 inches apart in rows about 15 inches apart. 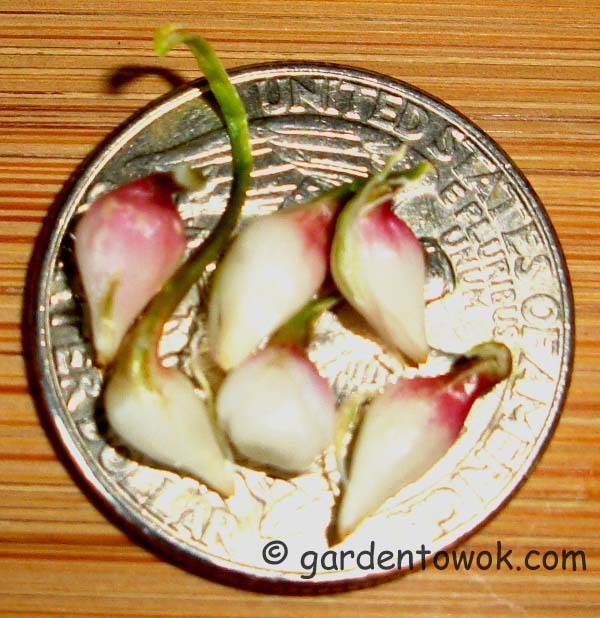 I plant cloves 3 inches apart, then in the spring (starting around mid-April), harvest every other plant for use as garlic green. Photo below. 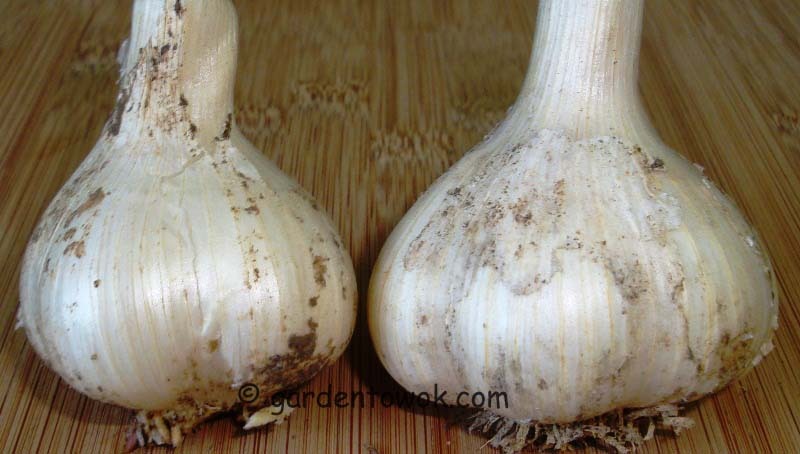 For additional planting information, click here for Cornell University garlic growing guide. To use garlic green: Use garlic green as you would onion, scallion or chives. Combined with other vegetables or use alone as a special spring treat. Click here for recipes idea (meat, poultry or shrimp can be substituted for the pressed tofu in the recipe). To use garlic scape: Garlic scape is another spring treat. The whole scape (stem and bud) are edible. Click here to learn more about garlic scape and a recipe. Click here for more recipe ideas (chicken, meat or pressed tofu can be substituted for the duck; garlic green can be substituted for the garlic scape in the recipe). Garlic scape straightening up. Photos top and right (click on photo to enlarge). These tiny bulbils are from the garlic bud at right in the photo below. All 6 are on a United States quarter. This gives you an idea of how tiny they are. Different stages of garlic scape buds (click on photo to enlarge). Harvest while the buds at the 2 stages at left, scapes are tender and buds are edible. Harvest when the bud is at the 3rd from left stage in photo, scape is still tender but has a stronger garlic flavor. Bud 4th from left, the scape is no longer tender, 5th, 6th and 7th bulbils at different stages. To harvest garlic: Harvest garlic when the lower leaves are brown and the top 3 – 4 leaves are green (for me, it is between late June and early-mid July, depending on the variety). If your garlic bulb split when you harvest, you harvested too late, cloves will not store well so use quickly. ♦ Using a garden fork, dig near plant (but not too close) to loosen soil, gentle pull garlic out of ground, brush away any soil (do not wash). ♦ Leave tops and roots on. Place in a well-ventilated room to dry and cure (keep out of sun). ♦ Once tops and roots are dried (3 – 4 weeks), they can be cut off. ♦ Select the largest and best looking bulbs and set aside for seed, if you are growing more than one varieties, remember to label. If you have no seed garlic, purchase some from garden center, catalog, garlic festival or better yet, a friend may be happy to share. Do not use garlic from the food market for 2 reasons. 1. It may not be a suitable variety for growing in your area. 2. It may be treated with growth retardant. To Store: Store bulbs in a cool dry place. As a guide, hard neck may keep up to 4 months, softneck up to 8 months. In my June 8, 2012 post I mentioned I was observing whether removing the garlic scape had any effect on the size of the matured garlic bulb. The answer is yes. As the photo above illustrated, the scape was not removed from the bulb on the left, it weighed 1.5 ounces. The scape was removed from the bulf on the right, it weighed 2.25 ounces. Both are the same variety (music garlic) planted side by side. KITCHEN HINT: To get rid of garlic smell on fingers, rub a piece of stainless steel flatware under cold running water. This post has no recipe, but I thought some of the readers of Thursdays Kitchen Cupboard may find some of the information useful. So hope you don’t mind my posting. This entry was posted in Gardening, Vegetables and tagged 100 posts, garlic, garlic bulbil, garlic green, garlic scape. Bookmark the permalink. I love growing garlic. One year I even did the braiding thing and hung them up. They never last long at my house because I just love garlic. I tried the braiding but could not get the braid to look pretty. Congrats on 100 posts, Norma! And I love all the garlic info… we tried one year, but things did not go to well – I think we planted them too early. Thanks. You may want to check with your cooperative extension to see when is the ideal time for planting garlic this fall in your planting zone. Congratulations on your 100th post Norma, we’ve all learned so much from your experience in the garden. My gardening friends that have tasted your cooking always laugh about how good you make any and everything taste. Yesterday in the garden when I was watering I said should I bother watering this okra? ( yuck! choke! choke! ) Oh yes, Norma likes it and we know she is the only one that can make it taste good! :0). And I bet you can too! Thanks. Give okra another try. Would you believe my very first published blog post was about okra. Cannot wait to see what you’ve got in store for us in the next 100 posts. Thanks. It was not planned, just happened and I am glad. Thanks. Didn’t think I would reach this number. I forgot to write in my post not to use garlic from the food market as seed garlic. Amended the post..
You are welcome. You can also interplant garlic with your flowers. You are a professional gardener! Congratulations on your 100th post!! Thanks. I am far from being a professional gardener, I have no formal training plus am learning something new about gardening all the time. Garlic, garlic, garlic! Gorgeous photos. Lovely garlic! This is such an informative post — I especially like the bulbils all bunched on a quarter. Congratulations on your 100th post. Thanks. I am glad I thought of the bulbils on the quarter otherwise it is really difficult to visualize the actual size. I’m so happy to see this today! I’d like to grow some garlic this year and have started to research the different varieties. Which soft neck and which hard neck do you favor? I do not have a favoirte. The hardnecks are music and German white. I do not know the name of the soft neck, they were given to me decades ago by a Ukranian neighbour who brought it from the Ukraine umteen years ago. Great post Norma – so informational! Thanks, glad you found my post informational. Congratulations on your 100 posts Norma – quite a milestone! I’ve never tried growing garlic – do you think one could grow it on a balcony in a pot? Thanks. I am sure you can grow garlic in a pot. The problem is timing. 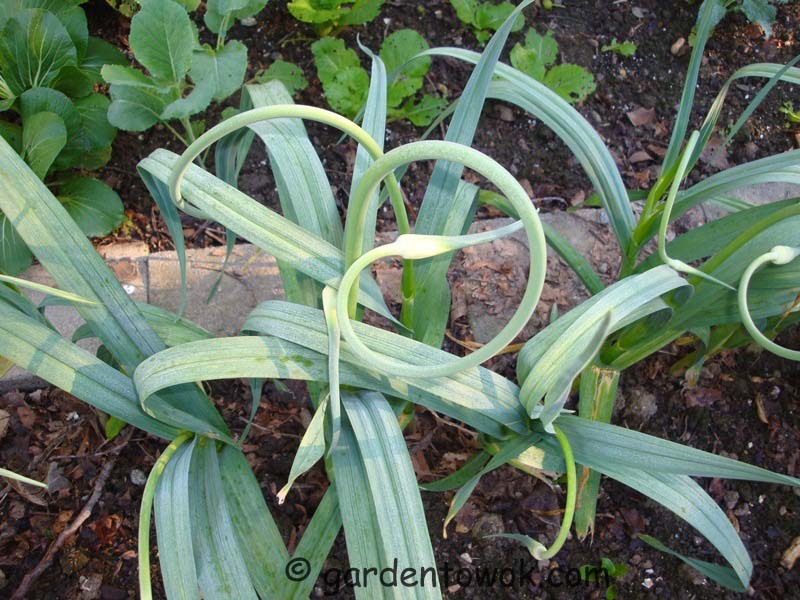 You see garlic needs stractification (like tulips) but will it be OK in a pot the whole winter? I do not know. What is a typical winter in Paris like? If I were you, I would give it a try if only to satisfy my curiosity. COngrats to your 100 posts. I also love garlic and eat them every day since I gathered them in my garden. Thanks. Sounds like you have a lovely garden. garlic that is my favourite. i must have garlic in every dishes. congrats! Thanks. I have garlic in most of my dishes too. Great round up. I am looking forward to having some scapes for the first time this year. My green garlic should be ready soon, I sowed a lot of little cloves really close in boxes and it seems to have worked well. Thanks, Gald to learn your garlic is doing so well. Very informative post Norma! Congrats on your 100th post! Thanks, glad you found the post informative, coming from you it means a lot. The pretty garlic braids are softneck, the stem of the hardneck is very stiff. I stumbled upon your blog via Daphne’s Dandelions Harvest Monday and I am so glad that I did. I just added a post to my blog this morning asking for help with Garlic. I had some that I purchased from the grocery store that started to sprout and I was wanting to use them and plant them in the garden. After reading your post, I can see that I shouldn’t do that and all the questions I asked in my post were answered. Thanks for posting this. This was a HUGE help. I look forward to reading more and learning from you wisdom. I would love to reblog this if it is ok with you. I think my readers would find it helpful. I will wait for you to authorize this before I do. Thanks again!!!!!! Thank you for visiting my post. About the sprouting garlic you have on hand, I would plant them and see what happens just to satisfy my curiosity. They may not have been treated with growth retardant and may grow. If they grow you will at least get garlic green and if they form bulbs that’s a bonus. Yes, you are welcome to reblog my post. Thank you so much for allowing me to reblog. I have a couple questions for you if you don’t mind. Should I wait till October to plant, like you mention in your post? And if so, how should I store them until I plant? I wrote to “plant in the fall about 6 weeks before the ground freeze”. I mentioned that I plant in October because I live in New York. October may not apply where you are. Since your garlic already sprouted, I would just put them in the ground and see what happens. Contact your local cooperative extension to get local planting guide. Thanks, glad you found my post informative. Garlic green has such a nice mild garlic flavor. Thanks. I love garlic too and sometimes overdo it. As you may have read, I posted a question at the end of my last post about Garlic. Today I was reading blogs and stumbled upon Garden to Wok. The post from the 13th was all about Garlic. I learned so much and thought I would share the post with you. Worth reading for sure. Garden to Wok is an awesome blog and I would recommend visiting if you haven’t already. Hope you enjoy!!! 100th post, wow, congratulations. Keep them coming. I keep learning tips from you site. Love the stages of the garlic photo! Thanks. Glad to know you are learning a little something from my site. Let me know if you discover another name for garlic scape. I think I posted this in the wrong post, pls delete from the other post. Congratulations Norma, 100 posts is quite the accomplishment. Thank you for posting about the garlic. I will bookmark for next year. I planted my garlic too early last year and it was such a mild winter, the bulbs rotted. But I replanted in the spring hoping for results and so far no scapes. But I will persevere. Thanks for the detailed notes and photos. I know I can always count on you for the straight goods! Hope you had a great weekend, and stayed cool. Thanks. The mild winter should not cause the garlic to rot. Where did you get your seed garlic? If you planted softneck you may or may not get scape. Took care of the other post. Thanks Norma, I just bought organic Ontario garlic from a farmer in Niagara. I’m not sure if it’s softneck or now, I’ll sacrifice one tonight to see how they are doing. Thank you kindly for the advice. You are so welcome. Hope your garlic formed a bulb. I ended up pulling them out last night, they are all drying in the basement. Yes they formed a good size bulb, considering I thought they were dead. I am very excited to use them. AND as an extra bonus, one of the tomato plants from last year sprouted and has a few flowers on it, so I will have some home grown tomatoes after all! Glad to learn about your successful garlic harvest, exciting, isn’t it!!!!! Looking forward to reading about your tomato harvest. Would you mind taking photos of your garlic harvest and write a post about your experience growing garlic in a container? Charles of Five Euro Food is interested in growing garlic in a container on his balcony. I need to try growing them, what gorgeous pictures you have here!! Thanks and you are welcome. Thanks also for visiting. Congratulations Norma on your 100th post. And what a wonderful and informative post it is. Thanks. Glad you found the post informative. I think that anyone interested in growing garlic should use your post as a wonderful guide. With your beautiful photos nobody should have any questions. Congrats Norma 🙂 WOW 100th posts that’s very impressive and I love the variety of your posts ~ Keep up the great work! Thanks, glad you love the variety of my posts. I am fortunately to have a shed, but I must open the door before the sun comes up and turn the shed into a furnace,. I am happy with this years harvest. Hope your garden bounce back. This is a very useful post, Norma, since I’m planning on trying my hand at garlic this fall. Thanks for sharing your knowledge. Glad you fid the post useful. Do consult your local cooperative extension to get planting dates and other information specific to your location. Your 100th post, and a post totally on garlic! Love it! Thanks Norma, and congratulations on your milestone! What a great & tasty 100th post this is, Norma! I loved reading all about these veggies! Very informative too! Congratulations on 100 posts! We love all garlic, but a special place in our hearts for mildness and flexibility of spring green garlic. We’ll be planting several varieties of garlic this year for harvest next year. Cheers!